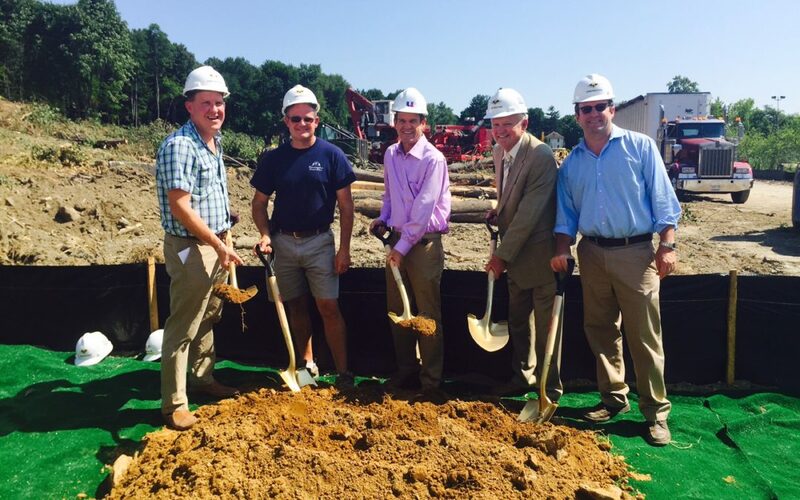 Poughkeepsie, NY – Fox Run at Fulton has officially broken ground. The ceremony was held on Thursday, July 16, 2015, at 66 Fulton Avenue in Poughkeepsie, NY. Elected officials and over 25 guests attended the 3:00PM event to celebrate the latest addition to the Poughkeepsie community. Page Park Associates is the owner of Fox Run at Fulton. Jason Page, owner of Page Park Associates, kicked-off the ceremony, thanking members from the Town of Poughkeepsie and PC Construction, the construction company in charge of building the new community. Following Page’s remarks, United Group’s Michael DiGiacomo spoke. “We are very excited to come in and make this a valuable experience for everyone,” DiGiacomo said. “We want to thank Page Park Associates for including us on such a great project.” Troy, NY-based developer, The United Group of Companies, Inc., will be the property manager for Fox Run at Fulton. Fox Run at Fulton will be built in two phases, the first phase expected to be complete in Fall 2016. Phase 1 will be comprised of 70 apartments and 234 beds. The fully-furnished, amenity-rich apartments will include granite countertops, stainless steel appliances, private bedrooms with private bathrooms, and a full sized washer and dryer. Community amenities will include a modern fitness center, outdoor green space with BBQ grills, Wi-Fi throughout the community, and more. This suite-style living community will be state-of-the-art housing, with sprinkler systems throughout the building. The buildings will house a 24-hour centrally monitored alarm system. Pre-leasing will begin in September 2015. For more information, call 518-265-6960. Page Park Associates began in 1979, building new buildings and renovating other structures for office/manufacturing space for International Business Machines (IBM). Over the next few decades Page Park Associates successfully grew the business through property acquisitions, diversification into related markets, and growth of their staff with additional experienced, skilled professionals. Headquartered in the Poughkeepsie Journal Building, the company currently owns and manages over 700,000 square feet of commercial space and as such has developed long standing relationships with their tenants who include private business, medical organizations, non-profit entities, and government offices. The legacy of a quality company committed to its tenants continues today with the current managing partners. Learn more at www.pageparkassociates.com. The United Group of Companies, Inc., headquartered in Troy, NY is a nationally recognized, award-winning corporation with over 40 years of experience. United Group has become known for its successful development, acquisition, repositioning, and property management for a variety of real estate assets including student housing, independent senior housing, multi-family rental housing, commercial offices and mixed use developments. The company has developed more than two billion dollars of successful real estate projects, and has approximately 200 employees across approximately 40 assets in New York, Georgia and Florida. The United Group has over 35 years experience in property management. Additional information is available at ugoc.com. The Denver Post: A rental retirement: With Denver home prices increasing, The Grove at Stapleton offers an active lifestyle from $1,810/mo.